Valentine’s Day is a celebration of your love, so why not spoil the person in your life with a tailor-made holiday in the Maldives. The month of romance is around the corner and Crown & Champa Resorts is here to help you choose the perfect gift. 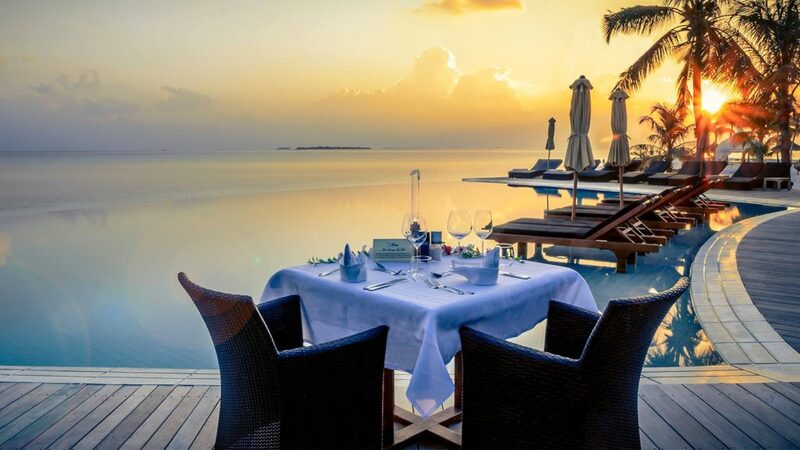 Crown & Champa Resorts has a choice of several resorts across the Maldives, each offering different experiences and possibilities in a picturesque setting. Choose from the best Resorts in the Maldives, then select the most romantic and intimate room for you, followed by some exciting activities. 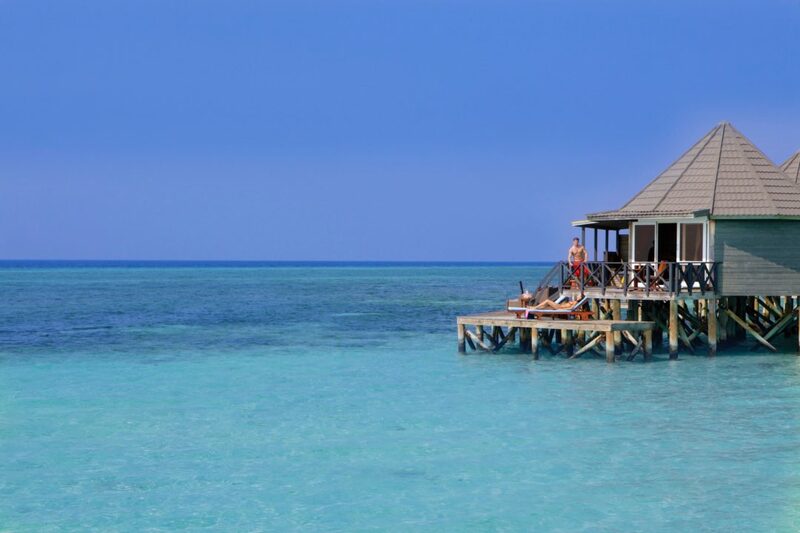 Indulge in 5-Star luxury at Hurawalhi Island Resort. 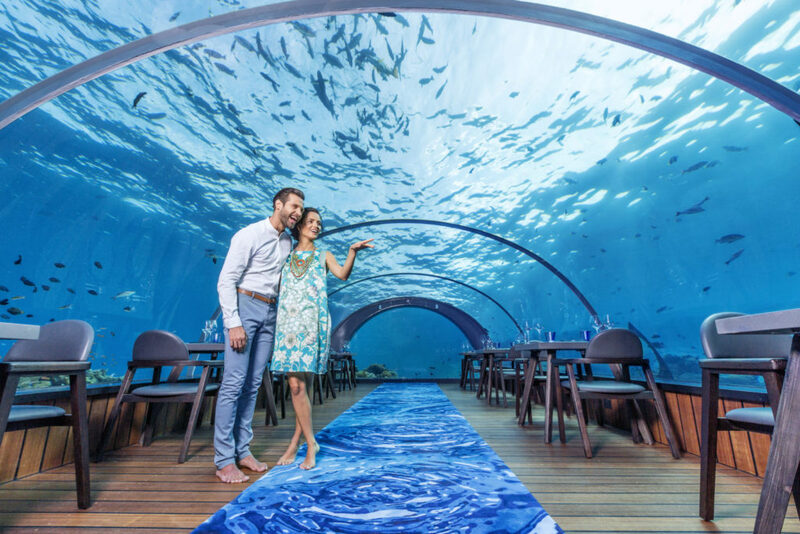 From exquisite architecture and design, to delicious cuisine and the once-in-a-lifetime opportunity to dine beneath the ocean at the 5.8 Undersea Restaurant. Intimacy is the specialty at Veligandu Island Resort & Spa & Komandoo Island Resort & Spa. 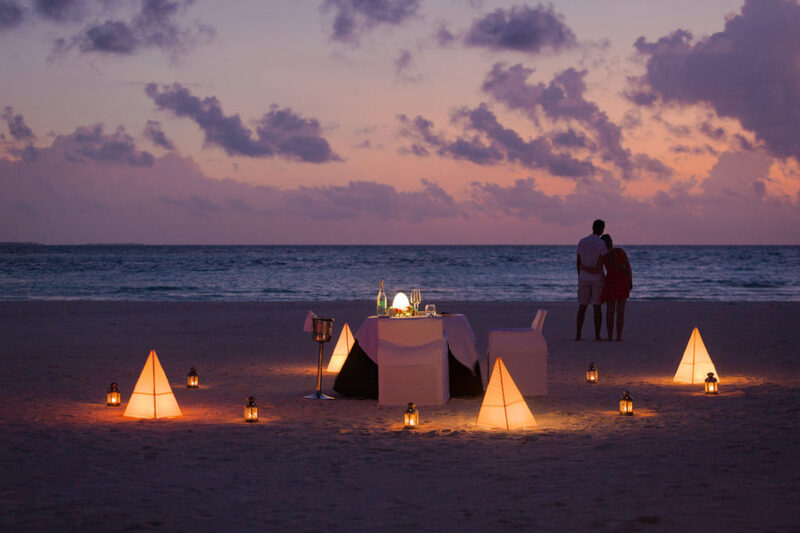 Escape to an oasis of calm with your partner, enjoy the famous beach dinners “underneath the stars” or simply relax on the white, soft sandy beaches with your loved one. 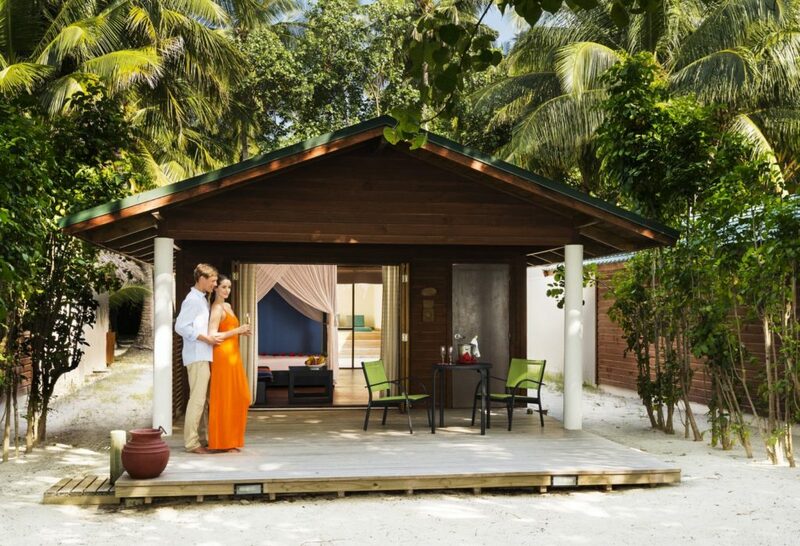 Vilamendhoo island Resort & Spa combines romance with adventure, for additional excitement during your retreat. 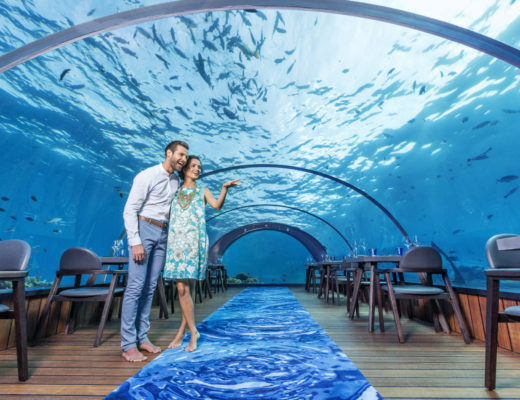 With one of the best reefs in the Maldives, you and your partner can enjoy underwater adventures and snorkeling expeditions on your doorstep, mixed with beautiful beaches and the opportunity to explore the best of the Maldives together. Between Kuredu Island Resort & Spa and Meeru Island Resort & Spa, you and your loved one will be spoiled with a variety of excursions, activities and options for your romantic getaway. The Resorts offer different room categories and romantic options to ensure that you’re your couple’s getaway needs are met. There’s something for everyone! Champa Central Hotel, has everything you need at great value. The Hotel is centrally located in Male’, ensuring you have access to a myriad of experiences, views and food to nourish your wanderlust. Make your stay extra special with personalized room and bed décor, breakfast in bed and a delicious dinner on the Rooftop. To top off your getaway you have a choice of activities and dining experiences. Indulge in a culinary journey with fine dining and à la carte restaurants or buffet dining on each island. Remember to capture each special moment with a photoshoot from the professional photographers at each Island. Create the best memories. Celebrate your love with Crown & Champa Resorts. We believe in beautiful destinations, authentic connections with loved ones and spending quality time together. 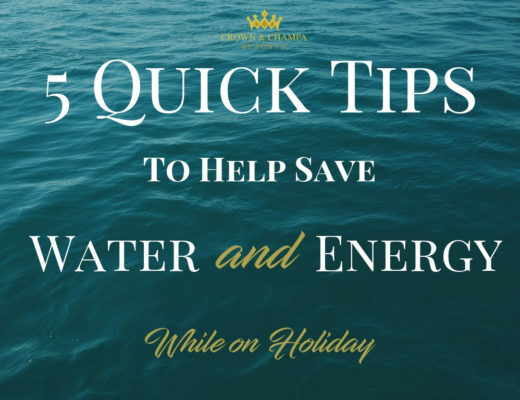 What better place to do this over the Festive Season than at one of the Crown & Champa Resorts in the Maldives. If you weren’t here, We Missed You and would love to see you soon! If you were here, we hope you enjoyed every minute as much as we did. 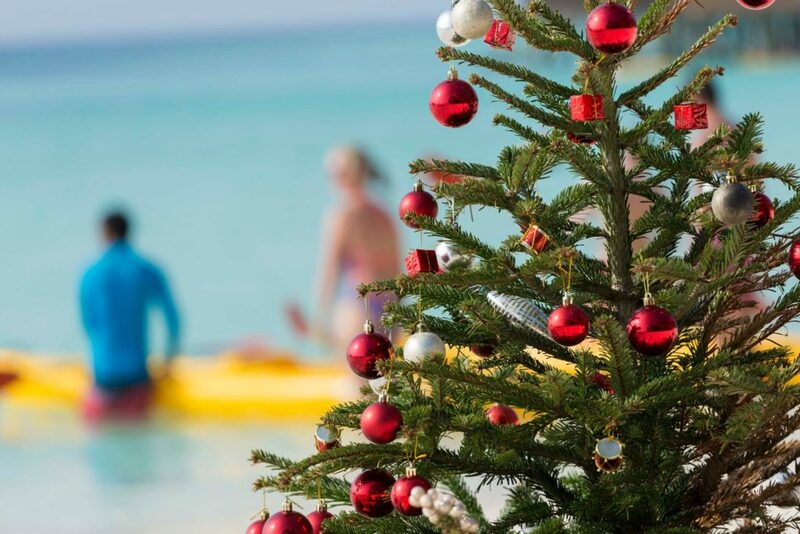 Come island hopping with us as we reminisce about the festive season. 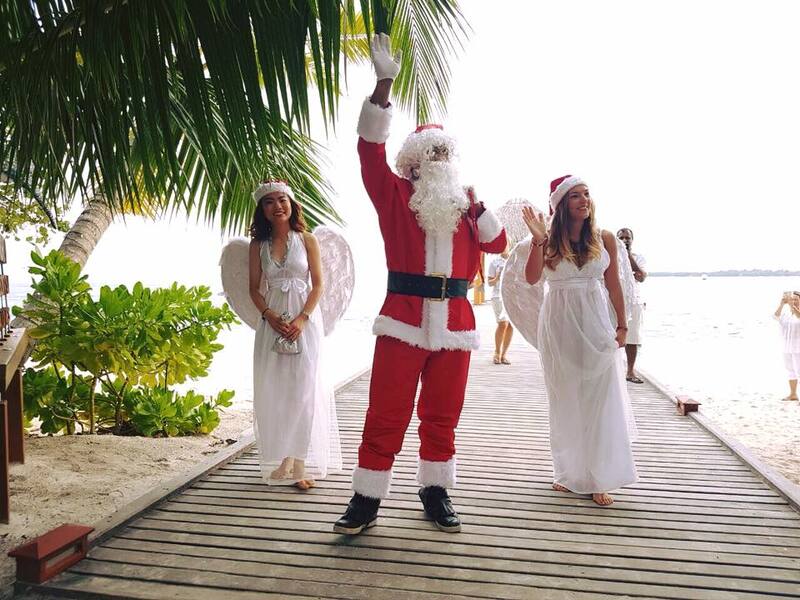 Christmas Eve on Kuredu Island Resort & Spa started with the switching on of the lights, Christmas dinner and a sultry snow party. 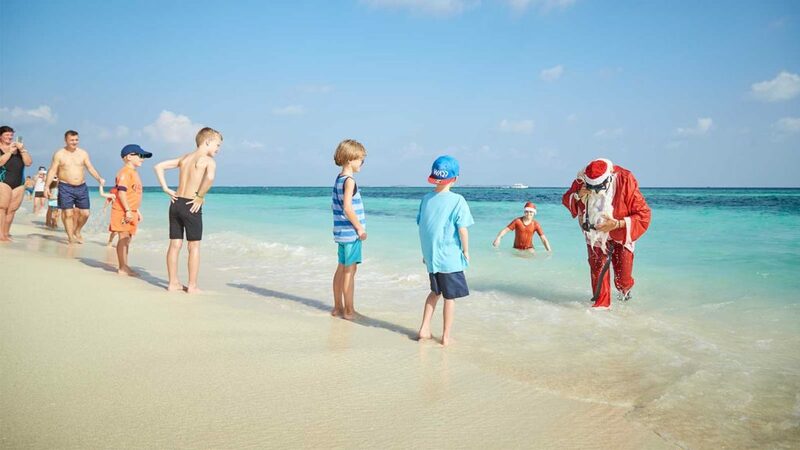 Santa arrived on Christmas Day on a jet ski to hand out gifts and ended off the excitement with a Beach BBQ Dinner. The fun continued after Christmas Day with the Christmas Crab Race, a relaxed Christmas Movie and a scrumptious stroll through the Christmas Street Market, which led up to the annual Kuredu Gladiator Fight & Fire Poi. The final hours of 2017 at Kuredu were rung in with a New Year’s dinner and an epic pool party. 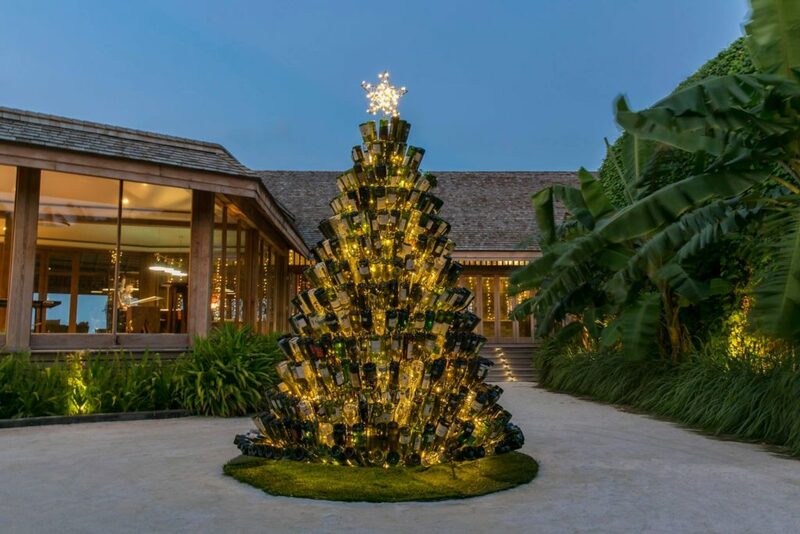 The enchanting Hurawalhi Island Resort was a paradise of Christmas celebrations with extravagant cocktails, a picturesque gala dinner and beach party to match. The island’s New Year’s Eve was an unforgettable gala dinner and tropical soirée with bubbles from Tattinger, followed by a champagne brunch on new Year’s Day. 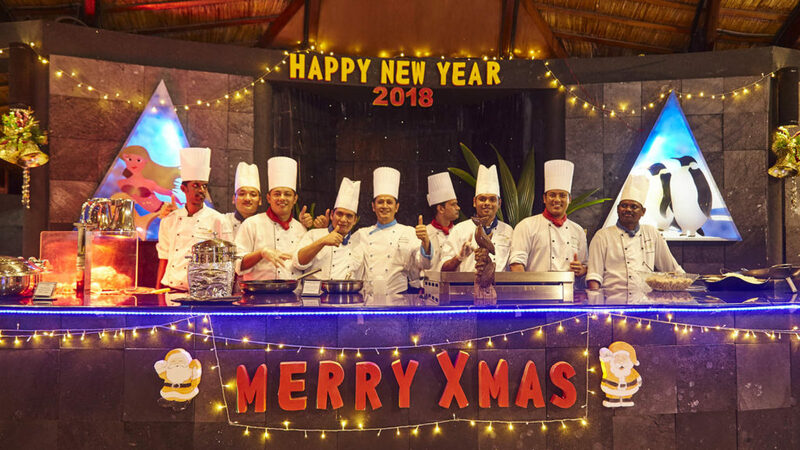 Veligandu Island Resort & Spa partied the festive season away with delicious dinners, lively entertainment, hilarious games of couple’s lip reading and chill-out saxophone sessions, just to name a few. 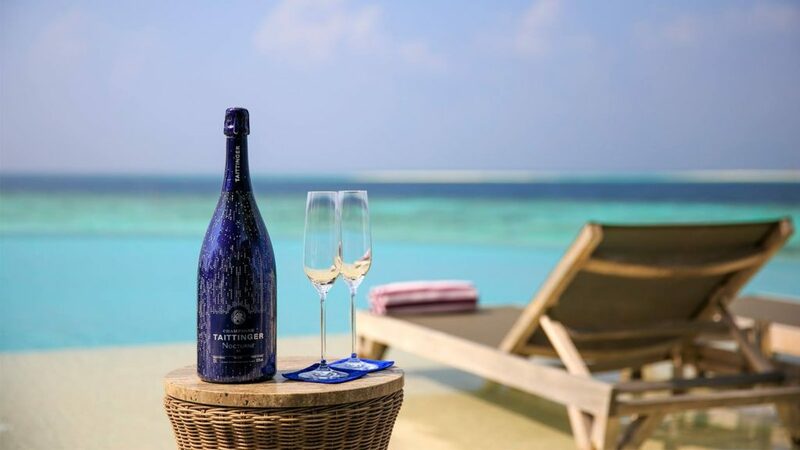 All guests who purchased a bottle of champagne during New Year’s Eve took part in a festive Champagne Lucky Draw for a chance to win the grand prize of a 7-night stay at Veligandu Island Resort & Spa and more. 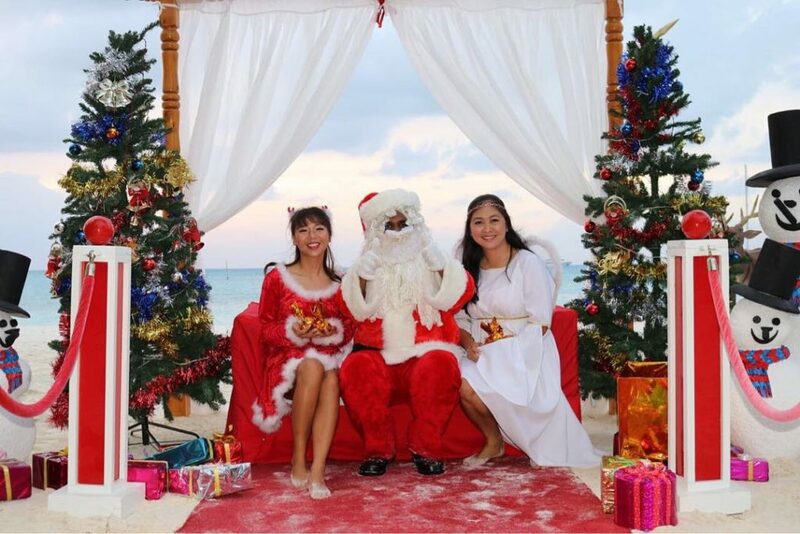 On Christmas Eve Santa arrived bearing gifts for the little ones, with harmonious Christmas Carols by the island choir with the night ending in a Christmas Gala Dinner and exuberant party. The New Year’s countdown was celebrated with cocktails, a gala dinner, a party filled with giveaways and best wishes for 2018. If you know Meeru Island Resort & Spa, then you know there was something for everyone this festive season. 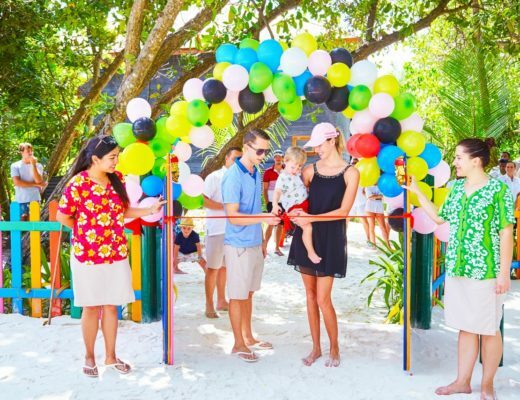 Beginning with a journey through the history and culture of the Maldives, nature walks on the island, chill-out sessions and live bands, canoe races and a treasure hunt for kids. Christmas Eve saw Santa arrive by boat to surprise the kids with gift. The celebration continued with a night of cocktails, a gala dinner and a chance to dance the night away at the annual party. The countdown to 2017 was the perfect time for a sunset chill-out session, gala dinner and beach party. New Year’s Day started with the fun-filled annual Meeru Guests Vs. Staff Football. Our adults-only island, Komandoo Island Resort & Spa, had a charming festive season with a cocktail making class, Santa’s arrival, a Christmas dinner and party on Christmas Eve. As a build-up to New Year’s Komandoo had interactive Maldivian Handcrafts Class, yoga, fruit craving and sushi making before setting off on the last sunset cruise for 2017. New Year’s Eve was celebrated in style with a masquerade ball and champagne countdown. Here’s to 2018, a year filled with excitement, magic and adventure in the Maldives. Crown & Champa Resorts offers a unique and personalized experience to add to your tropical paradise holiday. From a warm and traditional welcome to the attentive service and special details that exceed your expectations, each Resort ensures that you enjoy the best and most memorable holiday in the Maldives. What contributes to Hurawalhi Island Resort’s luxurious appeal is the team that makes all those unforgettable moments happen. Director of Operations, Mohamed Solah is considered the teams’ vice captain and knows that the key to Guest satisfaction is to have a genuinely happy team that shares a passion for the workplace. Komandoo Island Resort & Spa excels in creating intimacy and simple pleasures, the feeling of calm, and making the ordinary feel extraordinary. One of the stellar Room Attendants, Saeed Ibrahim recalls the occasions where the finest details went a long way into creating the best and most romantic experiences for guests. In the 17 years that Guest Services Manager, Fikry Mohamed has been with Kuredu Island Resort & Spa, exceptional service and hospitality continues to be one of the top reasons why Guests return year after year to this Island paradise. He is extremely popular with repeat guest and he is known to go the extra mile to provide an unforgettable holiday experience. Planning a romantic proposal or a birthday surprise in the Maldives? Guest Services Manager, Sina Schwebler and her team go above and beyond to make your holiday at Meeru Island Resort & Spa truly special. 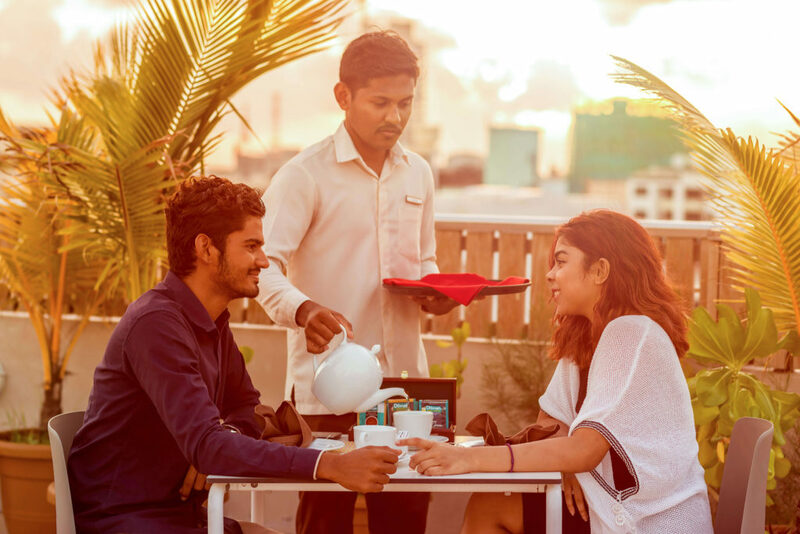 In addition, the Guest Service team ensures that all the information about the different meal plans, excursions and activities that guests can enjoy at Meeru. Apart from the ‘surprises’ arranged for guests on celebrating special occasions, Guest Services Manager, Desiree Boettcher and her team provide a warm and unique welcome to Veligandu Island Resort & Spa, the Maldivian way. Guests can hear the traditional ‘Bodu Beru’ drums beating from the moment they step onto the Jetty upon arrival. Guest Services Manager, Danijela Tautz and the Guest Services team at Vilamendhoo Island Resort & Spa express the importance of a real and genuine care for guests, from a ‘Courtesy Call’ to keeping guests informed about the Island and activities to enjoy. 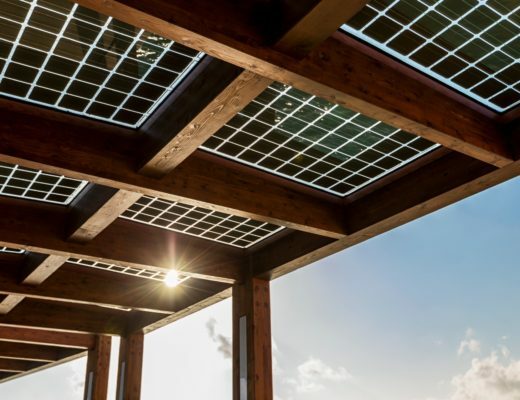 The team aims to provide unique experiences for each guest, the Vilamendhoo way. From the Male’ City Jetty #1, guests are transferred to Champa Central Hotel via the complimentary branded taxi. Front Office Manager, Adbul Waahid and his team meet each guest with a refreshing beverage and face towel to cool off upon arrival, as part of their warm and attentive service. The team believes in providing an efficient and friendly service from arrival, to departure and the special moments in between. Book at any of our Resorts by clicking on the name and enjoy the most personalized hospitality in the Maldives. 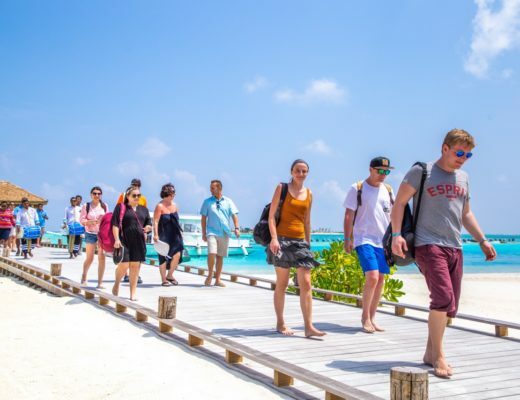 Following the success of the parent-event, ITB Berlin, leading Maldivian tourism group, Crown & Champa Resorts (CCR) will be exhibiting at the most anticipated travel show in the Asia. ITB Asia offers a three-day show and convention for travel industry experts to meet and discuss one of the most dynamic and rapidly growing markets. The trade show also offers the opportunity to establish global contacts and expand business reach to various markets, including the Asia-Pacific region. Crown & Champa Resorts looks forward to presenting the latest in Maldives travel and hospitality products, including our 5-Star luxury products Hurawalhi Island Resort and Kudadoo Private Island by Hurawalhi, which will be opened in the Summer of 2018. The show is celebrating its milestone of 10 years and has completely sold out, due to a surge in bookings from global markets. ITB Asia 2017 will be held at the Sands Expo and Convention Centre, Marina Bay Sands in Singapore from October 25 – 27. Visit the Crown & Champa Resorts stand at Hall E, Booth number K36.